It was moving and heart-felt and humourous and I enjoyed watching it. Impressions of the media coverage: Radio New Zealand's Geoff Robinson was the best because the man has class and conveys dignity and solemnity. TVNZ's coverage with Mark Sainsbury and Simon Dallow was a far more casual, chatty affair. Dallow has gone up a lot in my estimation over the last few years - I once told their pollers he was smarmy if I remember rightly - and sometimes he makes me wish I could take it back. However today he was simply talking far too fast for a funeral - a State funeral. TV3 just ran TVNZ's feed as did Alt TV in a wonderfully irreverently reverent programme that discussed towing issues and Oliver Driver's vox pop on the streets. The only problem I really had was the Hillary Collegiate's haka that RNZ spoke over and that TVNZ had no camera angle for - what a glaring mistake. What does this tell us of Pakeha cultural sensitivity? Did Robinson talk all the way through Dame Malvina Major's singing? He assumed it was some background warbling from some guy's double-parked car stereo that demanded to be talked over by the way he went about it. Poor judgement in an otherwise fitting broadcast. What dismayed me, and what I fully expected would occur, was the very modern spectacle of funereal applause. That is to say Hillary's motorcade being applauded and the family following in the crown cars being waved at by the masses lining the route. Applause to me is inappropriate. Old fashioned though it may be I think the cars involved turning on the headlamps, those along the route taking off their hats, and standing till in respectful silence to remember the fallen is the way public observance of a funeral cortege ought to occur. Quite frankly I regard applause as something done for the sake of others. Being silent is a moment to remember who has passed in our own way. It is a moment to think, to gather our thoughts. Clapping? What is that? I'm sure it was genuinely spontaneous; but so are riots and looting. Yes it should be a celebration of the man, his achievements and what he was to us, but... of sorts. Just because the man is a public figure does not mean we need to treat his final display as if he were a carnival attraction. 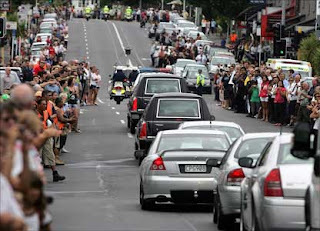 Could you imagine, upon seeing a hearse along the street, applauding it, and then waving to the bereaved family as though they were on tour? I simply cannot. Call it Americanisation, call it dumbing down, call it nervous excitement, despite it probably being or seeming natural to the people present - it just sits awkwardly with me. Of the many stories about my (very distant) relation that I liked was actually something Dallow said to Sainsbury: he mentioned his legendary bluntness and Sainsbury remarked: If he thought something was wrong he would say so. He is a unique national hero and role model for all of us. Words can never express adequately how we feel about this great man. I too thought the clapping was odd. Perhaps the first instance in NZ of the phenomenon started after Diana's death. One I like to call Mournsturbation. Oliver Driver made me switch channels with Olympic like haste. Aside from the fact he is an unusually large headed freak, his venal greed displayed by his buy nz made ad at the same time as his do not buy nz made ad (tindallcorp)sickens me. Driver's patronising nagging about how it's all our own fault for not getting off our arse to search for things NZ-made does sit uncomfortably - you would say hypocritically I guess - with the Warehouse campaign. But he's just taking the coin that every media-type would in the circumstances. I recall the anti-privatisation stance of Gordon McLaughlin not stopping him fronting the whole Telecom privatisation. There's probably numerous examples of this sort of expediency out there. How about Bomber's "oh, that guy looks like he is from the Bee Gee's"
and he has Maori relations too - however distant (such as me). No - rolling back the Pakeha take-over of every aspect of this country is the objective: that involves sharing not "taking over." Most Maori would like to have the ability guaranteed by our constitution to conduct Maori affairs in a Maori way instead of being treated as second class citizens when it comes to cultural recognition, property rights etc. they should have had no part in the procedings, after all tell me what maori would get off their lazy benefit bludging fat arse and go climb a mountain or do something for good old New Zealand ???? SInce you can't address that question to the Maori who braved the seas to come here originally - all the way down to the sub-Antarctic Auckland Islands - to found the most remote communities in the world, then perhaps you could address it to Olympic skier Simon Wi Rutene who has previously stood for the Maori Party. Geeze next they'd want the commentary in bloody Mouldy oohps Maooori ar jezzee what ever,. Yeah... the whatever comment applies to your entire, idiotic rant. You are an embarrassment to whatever race, gender, culture, religion, class and nationality you are. And if you already know that - if you sense that - then you should change your attitude and become a better person. I'm curious as to why you consider applause for the recently deceased as being an "Americanisation". I first encountered it prior to football matches in continental Europe where a moment's applause was seen as a fitting way to remember someone. It has since spread to include remembrances before football matches in England. It serves to focus attention on the subject, and reduces the opportunities for someone to be by inadvertently or disrespectfully breaking the silence. Perhaps the tradition of applause did arise form America, I don't know. However, it seems from glancing at a wikipedia article that it is a "moment of silence" which is an Americanisation, with it being used euphemistically (keeping within th constitution separation of state and religion) for a time for religious prayer.